Transplant Day 38 and Look Mom! 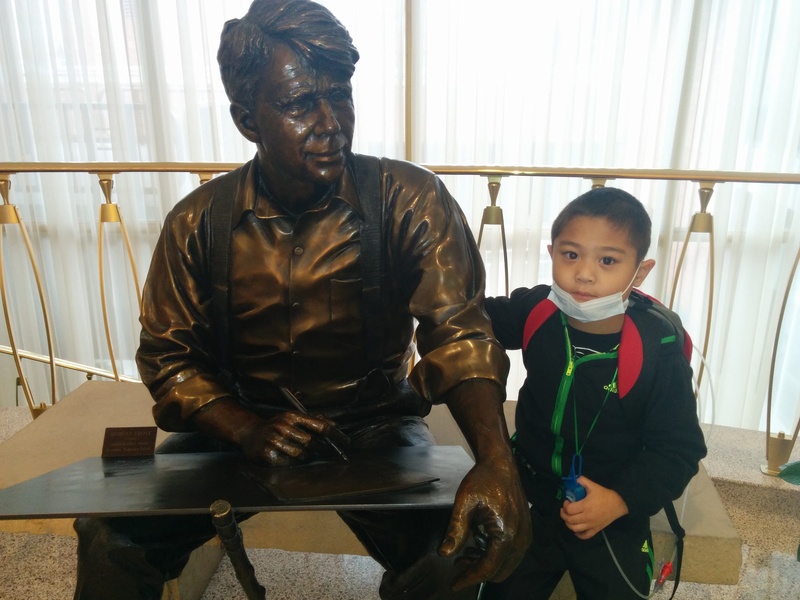 Patrick has been DYING to get his hands on this statue of Robert Frost since he first saw it. We also visited Thomas Jefferson and some other sculptures today. ‘m blogging at 3:30 p.m. because I expect Patrick to sleep all afternoon. He had a pump alarm at 5:30 a.m. and the nursing staff tried to pull a “while you’re awake” rush at vitals and other care. The result was that he was wide awake, and since labs were due half an hour later.. well, he was up. But I wasn’t ready to be up, so I we talked and agreed to turn on Blues Clues so he wouldn’t wake up the neighbors and then I layed down and slept while he watched. I’ve decided that, given that insomnia is a well-known side effect of steroids, I need to just go with the flow when he can’t sleep and this is one solution that has worked. The problem is that this worked almost too well. Patrick would wake me every 10-15 minutes or so and tell me something about his show. And I’d tell him I’d get up at the end of the episode.. then I’d fall asleep again. It was like I was a teenager with a snooze button again. I slept till 9. But it worked for us today. When I got up we were productive. Bath. Dressed. Playtime. Meds. Cleaned up the room. Zofran worked so when he got up, he felt fine. Rounds came early. The doctor heard Patrick’s number and looked at me and said, “Well, do you want to go out?” He was entirely sincere, I think. The resident, however, got this panicked look on his face and said, “The coordinators (transplant coordinators) said not on the weekend!” I knew that really they need tomorrow to pull things together the right way and kind of laughed it off. It’s good to hear that they are earnestly considering discharge, though. We’ve had a good day so far. The morning kind of dragged. Hospitals are so quiet on Sundays. We did a little bit of primary (Sunday School). It didn’t go over as well today. Patrick’s body was saying “move” and so sitting talking wasn’t going over so well. Singing time was a little better. I bought a little app that plays the church songs with a bouncing ball over the words and I sing along. He mostly just watches me. But I did get him to try and repeat one of the Christmas songs. And we watched a couple of videos. Today we talked about the resurrection and Patrick hands down refuses to believe that Jesus died. He knows “He is just ok, mom!” So I tried to explain that He died and is alive again and we used some exam gloves to demonstrate the spirit in the body and not. But I think this concept is still beyond him, oh well. Because Patrick was needing to be up and moving, we went to the playroom. I set up bowling. He took one throw, then grabbed a chair and told me bowling was better sitting down. Yeah, his body is saying move, but it’s also saying “Gee, I’m tired.” So we tried bowling from a chair and that didn’t work so well. So we tried just sitting on the floor rolling a ball back and forth which worked better, but wore him out pretty quickly, too. He got up to play with magnets and his feeding pump started to alarm because it had run dry. Today, though, that was good news. I asked his nurse this morning how she’d feel about letting me use Patrick’s home pump for the afternoon. That way, I could practice with it, Patrick could get used to it.. and we could take advantage of how dead the hospital is on a Sunday. No sooner had I put the pump in the bag than Patrick was asking for it on his back. And with it on, away he went! He just about ran out the door without me. We went all over the hospital today. We went up to the NICU where the rooftop garden is. The garden doors were locked for the weekend. (BOO! )… But Patrick insisted on playing on the flight of stairs leading up to them. He long flight made him huff and puff, but he found a set of 4 steps that he declared were “easy peasy.” And, easy or not, he tried them a few times. 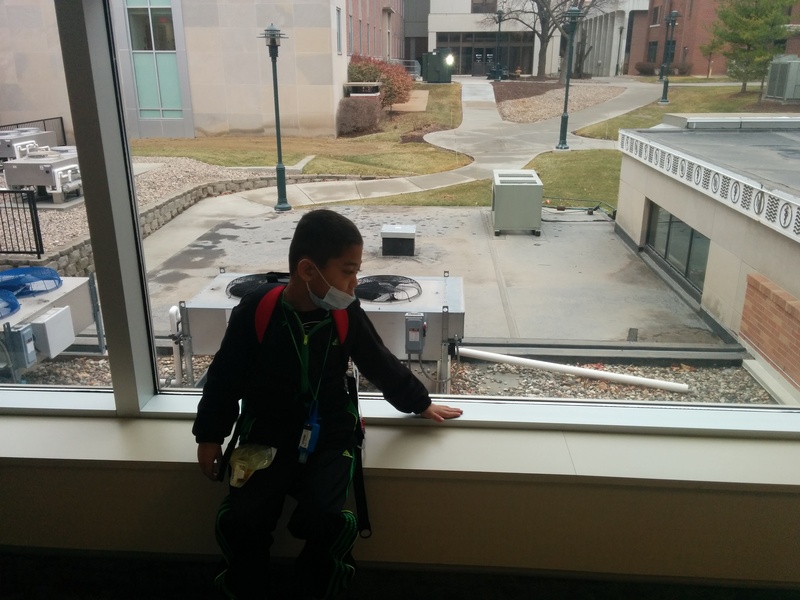 Then, we decided to walk over to other hospital building called Clarkson tower. Think walking from Primary Children’s to the University of Utah… only with the connecting corridor being about 2-3 times as long. We had to stop to take a few breaks. Thanks goodness for benches and Christmas trees along the way. But he made it… and at one point, he shouted, “Look, Mom! I’m runnin’!” And away he went down the hall until he couldn’t go any more. He claimed to really like this view. I think he really liked the window ledge to rest on. We washed our hands about a billion times. (Patrick is more than happy to wear a little portable hand sanitizer around his neck and wash his hands as well as the hands of anyone else standing near him.) We practiced pushing elevator buttons with wipes and with our elbows. We talked about what it’s safe to touch and what’s not safe to touch. Learning to be immune suppressed is going to be a big stretch for Patrick. We’ve always said that Patrick was fragile, but needed an immune system and so we have exposed him to as much as possible before. Now, the opposite is true. Before, a cold would have taken him a while to recover from but he could fight it. Now, he might not be able to fight what for us is just a mild virus. So hand washing and mask wearing and no touching and germ fearing and crowd dodging are going to be our norm. At least for the immediate future. The transplant team here has told us not to keep him in a bubble. But also to be careful. And right now we may be erring on the side of too careful… But this recovery has also gone too well and we don’t want to risk undoing that if not undoing it is even an option. We came back to the room to take the sacrament. Patrick has really taken to the young men’s president who brings it. He just squeezed his way right into his arms today. And for the first time in weeks, he swallowed the bread. Of course, he also has had 1/4 cup of chicken broth and a few bites of pasta today… all his own idea. There may be hope of eating yet. Especially once we get outpatient and the foods are safe and familiar. If I can just figure out how to teach him it’s ok to swallow now. But for now, with Patrick napping so deeply, I might as well see if I can get a few things done just in case we do make it out of here tomorrow. 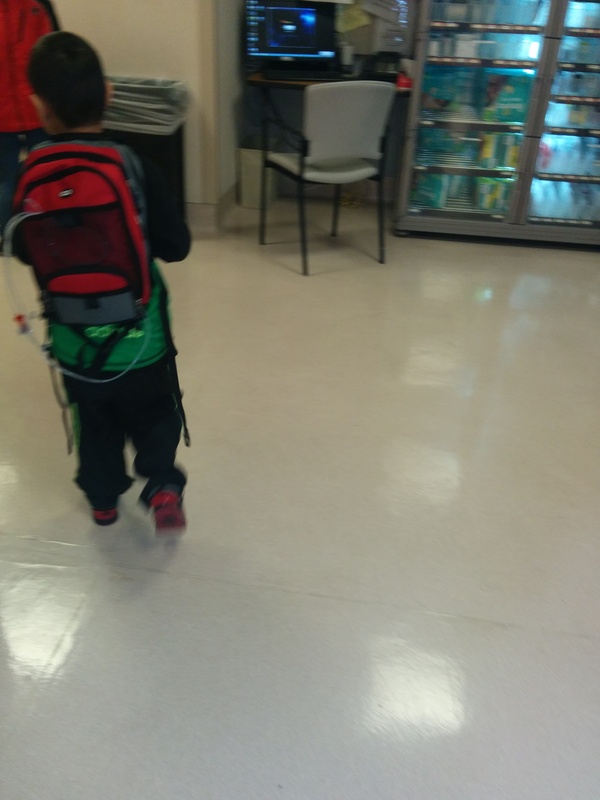 This entry was posted in G-tube/Enteral Feeding, Jesus Christ, LDS Church, Life as an SBS mom, Medical updates, Recovery, Transplant and tagged Christmas, hospital stays, immune suppression, intestinal transplant, proud moments, sabbath day, sundays, transplant, University of Nebraska Medical Center on December 8, 2014 by geekino.